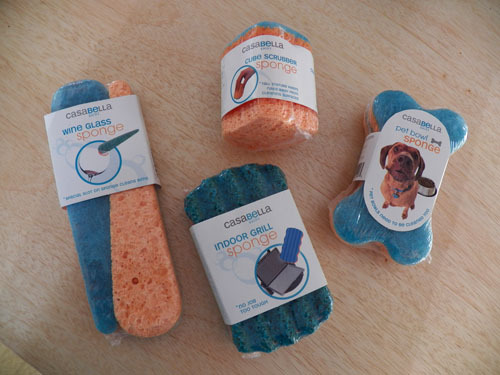 I found these really cool sponges from Casa Bella. Each one has a unique use. There is a wine glass sponge - I like these because they are long for reaching into glasses. Cube scrubber is taller than an average sponge so your fingernails don't hit the scrubby part. Indoor grill sponge has ridges for your panini press etc. Pet bowl sponge is shaped like a bone so you don't get it mixed up with your other sponges. It also helps encourage me to wash the critters bowls more often.